With her husband, Senator Aaron A. Sargent (Nevada City, Cal. 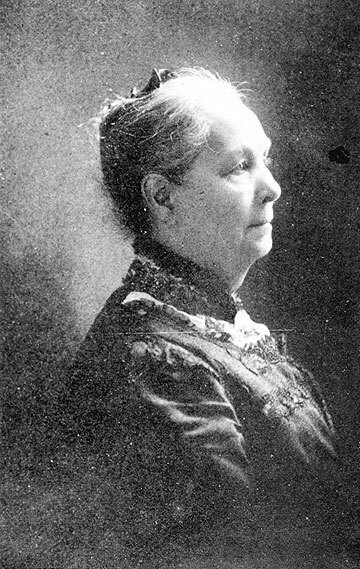 ), Ellen Clark Sargent became an early major link between suffragists in California and Washington, D.C. The Sargents established an early relationship with Susan B. Anthony. Senator Sargent was the first person in the entire Congress who uttered the word “suffrage” and wrote a suffrage amendment to the U.S. Constitution. In 1872, when Ellen Sargent became secretary to the National Suffrage Association, her husband went “to bat” for Susan B. Anthony who was jailed for registering to vote—a federal offense. Actually, she was fined for registering to vote, and when she refused to pay the fine, she was incarcerated. Senator Sargent went to President Grant to intercede on behalf of Miss Anthony and, in effect, “sprung” the great lady from jail. The Sargent’s home, wherever it was, was always open to all suffragists. At the time of the 1896 campaign, when Mrs. Sargent was president of the California Woman Suffrage Association, the Sargent home on Folsom Street was one of the main headquarters for the suffrage vote. In 1888, when Julia Ward Howe came west to visit her sister in Marin County, she met at the home of Ellen Sargent, along with Phoebe A. Hearst, Sarah Dix Hamlin, Emma Sutro Merritt, M.D. and others. This was the group that founded the city’s first woman’s club, the Century Club, which still flourishes at 1355 Franklin St. The impact of the Sargent family, including children George and Elizabeth, on the suffrage movement in California was inestimable. Only a few weeks, indeed, days, before women won their right to vote on October 10, 1911, Ellen Clark Sargent died. An unusual memorial, the first given to a woman at that time, was held, with Governor Hiram Johnson honoring her achievements in Union Square, San Francisco.